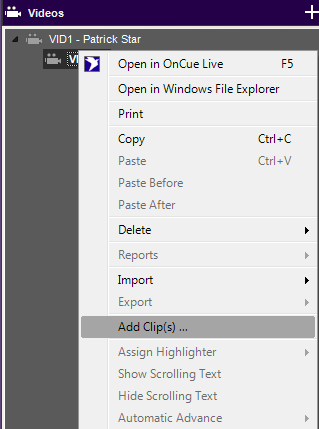 To edit multimedia within OnCue, you will need to create clips. You can do this one of two ways. 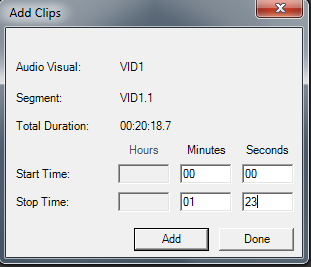 The first option is to expand the multimedia (in this example, VID1), and right click the segment you wish to edit and then select "Add Clip(s)". An editor window then opens up and allows you to enter the start and stop points you would like to save as separate clips. Click Add to create the new clip, repeat as many times as necessary, then click "Done" when you're finished creating the clips. The other way to add clips is by using the Edit Mark In and the Edit Mark Out points (See Video Controls in Multimedia Viewer) and hitting Save Clip . Beneath the segment in the Video tab, you will see the new clips you've created. These can then be fine tuned in the Video Tuner just like you do Designations. See Fine Tuning Designations. After tuning, you can export your clips by putting them in a Presentation and exporting the cuts to video. See Creating Presentations and Exporting Presentations.